"Munger Place Days’ Street Festival and Art Fair will be part of Munger Place’s three-day weekend of events celebrating the neighborhood's history and community. Sunday's Street Festival and Art Fair will have live music, a food truck court with 6 food trucks, a variety of arts and crafts vendors, and activities for children and adults (everything from a bounce house to mini yoga, martial arts and Irish dancing classes!). Come finish your Christmas shopping in September while your kids have fun and your husband hangs out with delicious food!" "The Rockwall Rubber Duck Regatta is a fun, family-friendly event guaranteed to be a quackin’ good time! There will be entertainment for all ages, including vendors, arts & crafts,games, food, Family Fun Run, 5K Duck Dash, and, of course, a rubber duck race! Thousands of rubber ducks will race down the fountains at The Harbor in Rockwall. These ducks, which have been adopted by supporters of the fundraiser, will then race toward the finish line, to win great prizes for their adoptive parents.All proceeds will go to support the Boys and Girls Club of Rockwall County and Meals on Wheels of Rockwall County. " "Bring the entire family and shop till you drop at the Roxy Art Fest and Taste of the Town! Enjoy over 75 vendors of all kinds, artists, musicians and all-day entertainment on two stages plus several interactive art stations." less than a mile from I-635 and Elam Road exit; less than amile from I-20 and Seagoville Road exit. "Fall on the Mound is the primary fundraiser for Trietsch Women in Christ Women’s Ministries, which donates to the Methodist Children’s Homes, provides scholarships for students, helps pay for church childcare services, aand other missions voted on by the council. More than 200 artists, jewelers and craft vendors will display their handmade works for sale at over 250 booths." 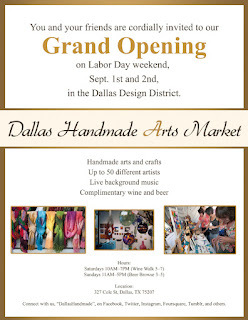 "The Aspasians Art Fair has been a Rockwall tradition for over 30 years. Shoppers from throughout the Dallas metroplex come to Rockwall for the fair. We provide extensive publicity throughout the year, particularly in the weeks preceding the fair. Aspasians also place directional signs from the highways guiding shoppers to the courthouse square. "